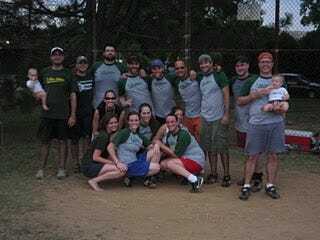 There's something called the Congressional Softball League in D.C. Among the teams in that league is one representing the Office of National Drug Control Policy. They go by the name Czardinals. Well, there's another team comprised of people from drug-policy reform organizations who "support ending the 'war on drugs.'" They're called the Capitol Hemp One Hitters. See what they both did there? The way the CSL schedule broke down, the Czardinals and One Hitters were supposed to do battle today. They're both 2-1. It's an early season statement game. But 'twas not meant to be. The ONCDP Czardinals pulled out shortly after scheduling the game, with ONDCP public liaison coordinator Quinn Staudt citing an "accidental double-booking." Sounds reasonable and apolitical enough. And, heck, maybe they did have some drug warring to git on with. This is not the first time the Czardinals have refused to play the One Hitters. Oh, here we go. Politime! In 6 years, the team found one reason or another to avoid taking the field against this team of individuals dedicated to reforming the out-of-date and ineffectual policies promoted by the ONDCP. "It is really disappointing that the ONDCP not only refuses to have an honest debate with drug policy reformers about the absolute failure of drug prohibition, but also keeps ducking out of softball games with us," said One Hitters team captain Jacob Berg. "We think it would be a great opportunity to advance the discussion between drug law reformers and the people ostensibly in charge of drug policy in this country. I wonder if they are afraid to have that conversation. The drug czar said ‘legalization' isn't in his vocabulary, but it's just a friendly softball game!"